Very sorry, Mr Bob Dylan. Channel Subterranean Homesick Blues for this one. But yes, it’s working again. And if you didn’t understand that (No?) The little clamp thing that holds the pins together on the charger has snapped at the hinge, so it’s now held together with a hair band and am I happy with my uber expensive new toy today. No I am flamin’, not. I will be ordering a replacement and moaning loudly as only a wronged marketer can! Garmin to the rescue! I hope. I discovered this little video from garmin on the train and now I don’t have my garmin with me, but I’ll try this when I get in. Of course if this doesn’t work, there may be more blues – you have been warned. Look what the work Secret Santa bought me – no, not swollen ankles, running socks. 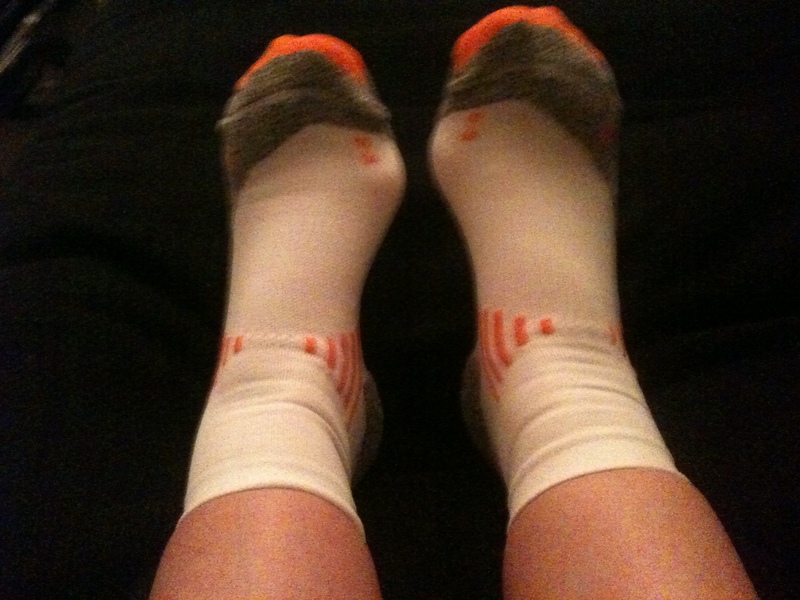 Very chuffed with this gift – can a girl ever have too many pairs of running socks? I doubt they’ll stay this white for long, given my running shoes’ attraction to mud and puddles (no it’s not me, it’s the shoes, I’ve decided) but I’m rather liking the RSS feed motif radiating round my foot. Bit concerned that on the label they’re called ‘marathon socks’ though. If that’s a hint from Santa, he’ll have to whistle for it for a good while yet. The annoying thing about having a fab new running toy is I have a rotten cold and feel like crap, which means I shouldn’t be out running today. I haven’t been out since Monday and now it’s Saturday. I’ve been sick for days and I’m still parked on the sofa in my pyjamas, awash in soggy tissues on a rainy Saturday morning at 11am. AND Harry the personal trainer is off to Canada for Christmas, meaning I won’t see him tomorrow so that’s going to be a whole month, at least, without one of our Sunday sessions. Bright side? I could always learn how to use my Garmin properly this afternoon, I suppose. Right, one blog entry on the joy of Garmin and then I’ll shut up. LOVE the Garmin. And we are almost strangers. Remember that first date that went ridiculously well – so well you didn’t go home for two days and your heart lurched all over the place and he/she was the wittiest, most attractive creature you’d ever clapped eyes on and you couldn’t eat or sleep? As I came through Didsbury my phone went off and I had to stop to grapple with the back of my running tights, pull it out and cut off the caller while a bus queue looked round to discover where a muffled version of Paranoid by Black Sabbath was coming from. (It seemed amusing at the time, when I downloaded it – I never really thought it through, the look on people’s faces, like when it goes off in management meetings…). Even with that delay and sundry roads to cross I turned in decent times – for me: 12.22, 12.30, 12.05, 12.51, 12.10, 12.32 = 1hr 13.5 mins. For the rest of this evening I’m checking out the website, me and my Garmin. We went shopping on Sunday and Santa/Mr M has bought me a Garmin 210, which basically means I can now track my every footstep, measure my times/speeds (such as they are) super-accurately, clock my heart rate and race an invisible stick man friend. I am, of course, beside myself with excitement. Mr M’s third nickname for me is Gadget Girl – he’s not blind to my penchant for Apple products nor my eye for extraordinary kitchen utensils (I swear by my potato ricer, even though I seem to bend them all out of shape). But a toy-gadget for running – does a gift get any better? Not for me. Now what am I going to call my invisible stick man running chum? I can run on water! No, not really, but according to my iPhone, this morning I managed to run though bricks and mortar, cunningly disguised as a hotel, traverse a wood and dash across the Mersey river before skirting a golf course. And all in the dark and before 6am. I am clearly missing my super-heroine cape and mask. I think we can conclude it’s the iPhone GPS that’s the problem rather than the app. It just seems to waver all over the place and stop and start from time to time. But we don’t do blame culture on this blog, we do solutions. And the solution seems to be one of those Garmins. Several of you have them and you all give them glowing reports. Of course, if there’s a GPS running solution out there I don’t know about I’m happy to consider all solutions. All advice gratefully received. A colleague of mine’s husband has something he ties to his shoe laces. So although the iPhone app’s results are what another colleague would describe as ‘a bit random’ I know when I do this route and it’s measuring distance properly that it’s 3.5 miles. And I know that today I ran it 45 seconds faster than last week. Main point here – I am running faster. And that will do for now, though I am itching to get to grips with a heart rate monitor. Mmm… more numbers. Never thought I’d hear myself say that!